April 2011 was an auspicious month for Hilary Hall. The start of spring marked 15 years of her being cancer-free, as well as the anniversary of her bone marrow transplant in April 1996 at age 12 for acute myelogenous leukemia. It also marked the first time Hall would lace up her running shoes for the Boston Marathon. “When I heard about the marathon in October 2010, I instantly knew that this was how I would celebrate,” she says. Celebrate she did, crossing the finish line in just under five hours and, with her Dana-Farber Marathon Challenge (DFMC) teammates, raising more than $4.5 million for Dana-Farber’s Claudia Adams Barr Program in Innovative Basic Cancer Research. 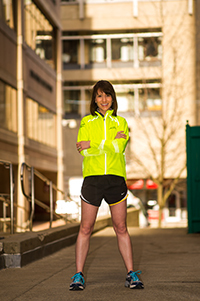 Hall, a clinical research coordinator in Pediatric Leukemia at Dana-Farber/Boston Children’s Cancer and Blood Disorders Center, planned on her 2011 marathon as a one-time celebration of her life after cancer. Along the route, however, she ran by a glimpse of her past – a girl with a face mask, the kind Hall wore for months after her transplant. As the girl’s parents cheered, Hall waved and smiled. Despite the mask, she saw the girl smiling back. “It was at that moment that I knew this was not a one-time deal,” she says. On Monday, April 15, Hall will join 19 Dana-Farber staff and more than 500 runners on the DFMC team for her second marathon. Her path from pediatric cancer survivor to marathon veteran is as extraordinary as her path to motherhood. When Hall and her family discussed treatment options 17 years ago, fertility preservation wasn’t their chief concern. More pressing was her survival. “Thoughts of not making it to my next birthday, let alone high school, overshadowed future plans for a family,” she says. But in 2010, her son Augustus was born. Two years later, while training for her second Boston Marathon, Hall learned she was pregnant with twins. For Hall, this pregnancy, like her first, was “a miracle.” Her doctors had thought it unlikely that she would be able to have children due to her pediatric cancer treatment. Yet, in June 2012, twin girls Adelaide and Eleanor, born at 27 weeks and weighing 2 pounds 4 ounces, joined big brother Augustus after three months in the Neonatal Intensive Care Unit at Brigham and Women’s Hospital.